For the Morisato household, it is a time of change. 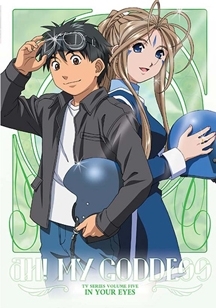 First Belldandy has a change of attitude, from perfectly innocent to the perfect opposite. A little magic accident gives Keiichi's gender a change of its own. Urd has some changes in store when she walks away from her job in an attempt to save her sister's life. She has her powers revoked, and she turns to "the Devil in Miss Urd" to get them back. Vol. 5 of 6, Episodes 19-22. In our many years online, we've had 5,122,901 sets of human and robot eyes examine our website.